Turn to the dark side this Halloween with this deluxe Darth Maul costume. 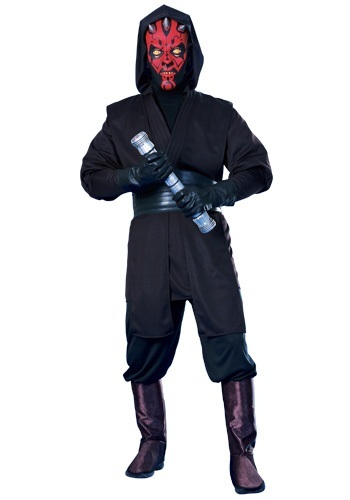 The adult Star Wars costume includes a hooded black shirt with long sashes that come down from the shoulders. The 100% polyester pants have an elastic waistband for additional comfort. Also included is a pair of polyester/foam boot covers, a half-face PVC mask, and a rubber cummerbund-style belt. Remember to accessorize with Darth Maul’s signature red, double-bladed lightsaber for the ultimate Sith look!